Posted October 28, 2018 by finnfemme & filed under Fashion, Vintage. 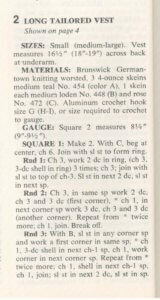 Long Tailored Vest Crochet Pattern, 1976. 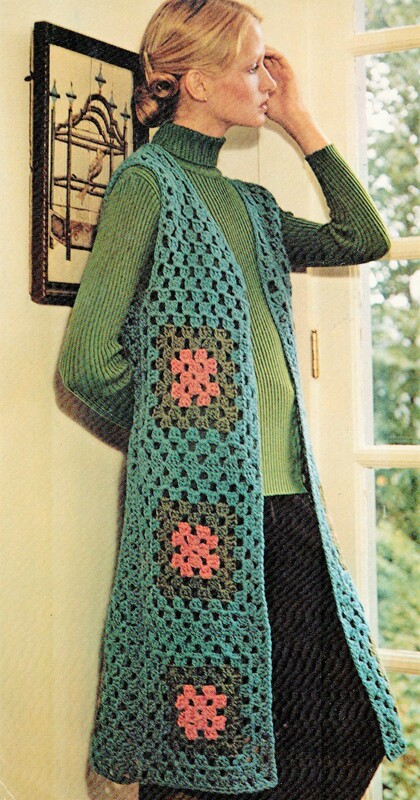 This is a fab vintage 1976 crochet pattern using granny squares to make a long tailored vest! Knee-length vest designed by Sally De Gaetano is made of large grannies connected with shells. Lower back and side seams have gussets of shells to give the gentle ease of a slight A-line. 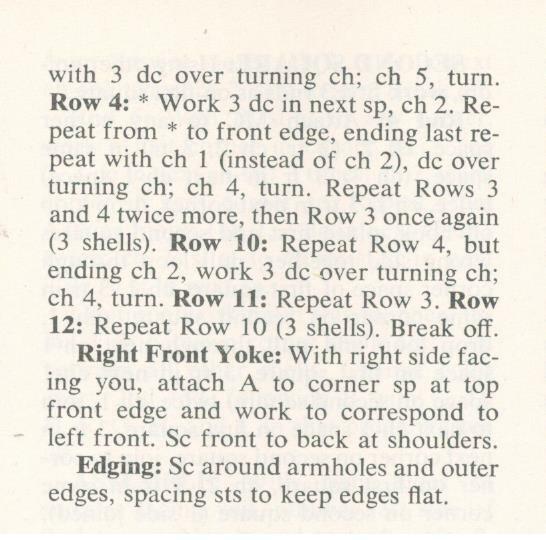 Shoulders and shaped neckline are also worked in shells. 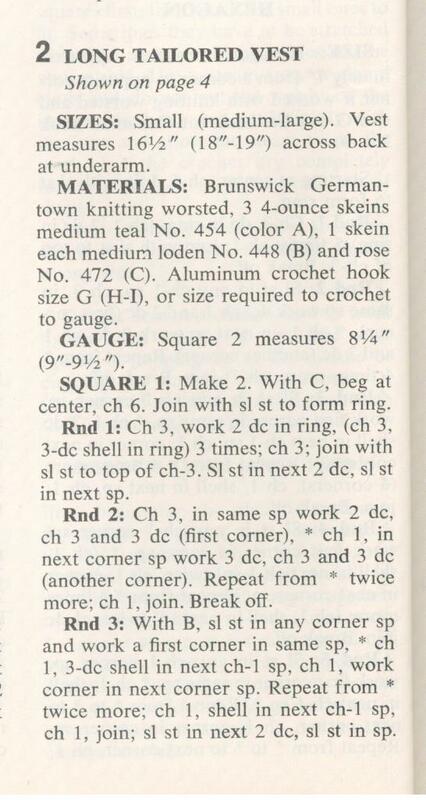 Make it with knitting worsted. 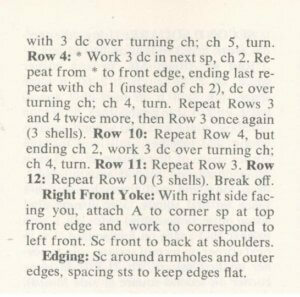 Instructions below. Please click on photos to enlarge. Posted October 24, 2018 by finnfemme & filed under Fashion, Vintage. This is a Virginia Slims cigarette ad from 1976, featuring model Cheryl Tiegs modeling the ‘tennis, golf, visit Aunt Martha, stroll-in-the-park sweater’. It’s interesting to note that in the 1970s smoking was still considered rather benign and socially acceptable. Case in point: here we have the healthy All-American model Cheryl posing with a cigarette and happily grinning. Virginia Slims, which was marketed for women, capitalized on the slimmer and longer cigarette as a contrast to men’s cigarettes. The tennis sweater was made of 100% acrylic and was completely machine washable (very handy when getting rid of smoke stench). 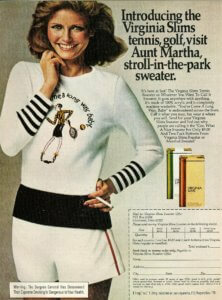 It was embroidered with a tennis racquet-wielding flapper lady and their slogan. “You’ve Come A Long Way, Baby”. Available for $9.00 and two pack bottoms from Virginia Slims Regular or Menthol. I have seen these tennis sweaters go for a pretty penny on eBay. My guess is that they are rather rare, considering the rigamarole you had to go through to buy it! Posted October 22, 2018 by finnfemme & filed under Beauty, Fashion, Vintage. 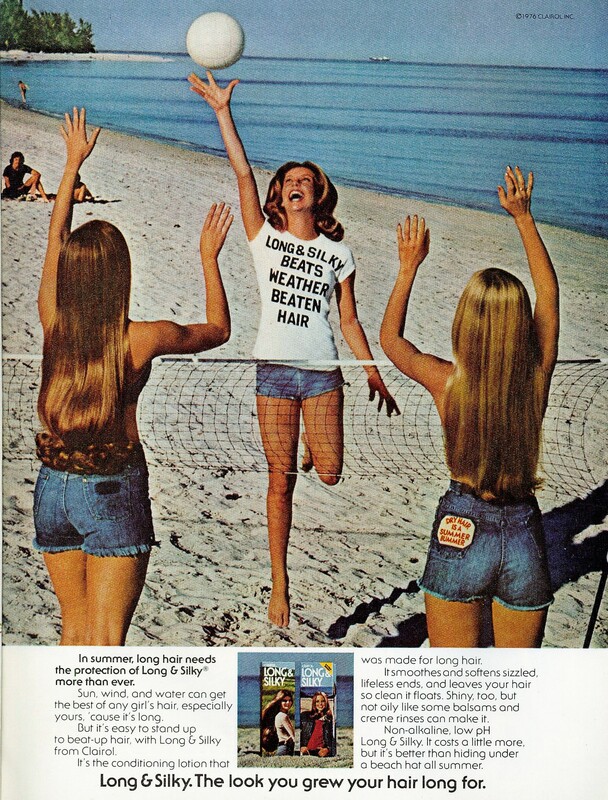 Long & Silky from Clairol, 1976. I had long hair in the 70s – at least until I got my Dorothy Hamill wedge cut – and I loved it. My hair was thick, straight, and my natural red color. It grew fast too. I never spent much time fussing over my hair because, like when you have good skin, you don’t have to do much to it. I drew the acne/bad skin card, so I guess it was evened out? 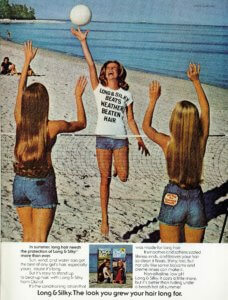 Anyway, this is a great ad from 1976 for Long & Silky Conditioning Lotion from Clairol. Three gorgeously thin and beautiful models wearing the shortest denim cutoffs possible are playing volleyball on the beach. “In summer, long hair needs the protection of Long & Silky more than ever”. Their hair is long, thick and glossy. Apparently using Long & Silky let it stand up to the harsh sun, wind and water of the beach. The graphic tee shirt is a nice touch – so very 2018! Posted October 17, 2018 by finnfemme & filed under Fashion, Vintage. 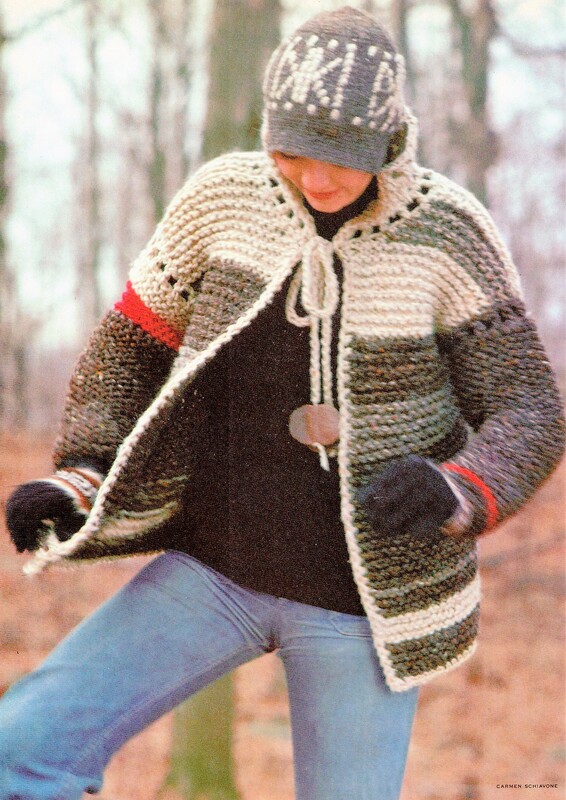 A fleecy soft pullover to knit yourself in fluffy French angora yarn, 1972. Right: A white sweatery flow into a scoop neck and trumpet sleeves. Below: A classic red cardigan with dolman sleeves and the softest knit of angora and wool, 1972. 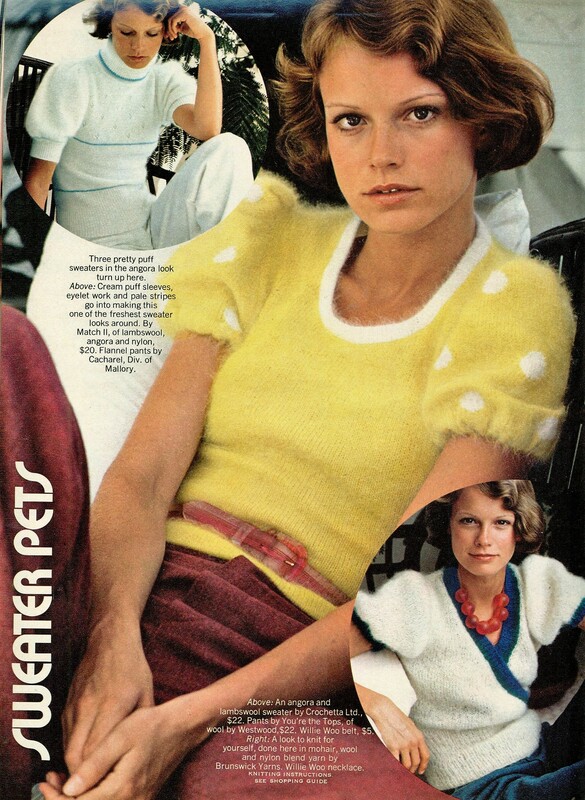 Three pretty puff sleeve sweaters in the fluffy angora look, 1972. Soft sport looks in the angora mood are what you see here. Right: This tennis sweater is done in the dreamiest pastels. Left: Pink angora vest layered over a pink gingham shirt, 1972. 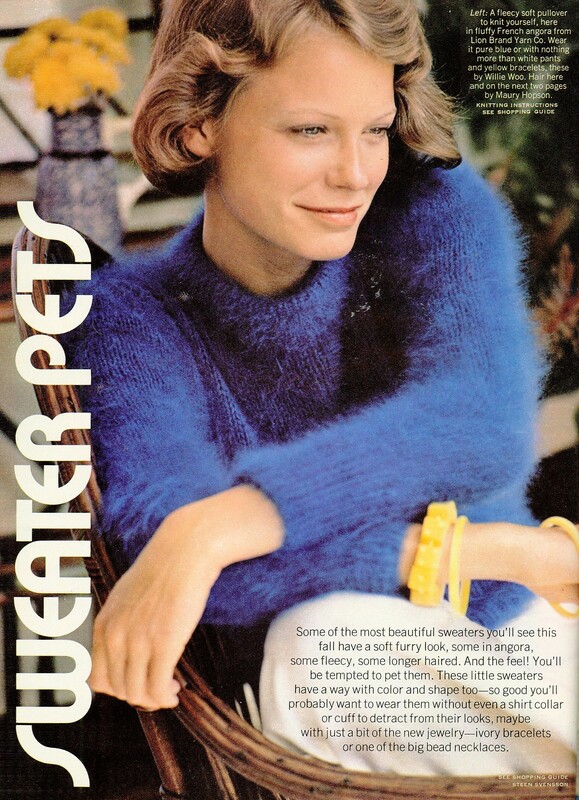 Angora sweaters come in and out of fashion every decade or so. 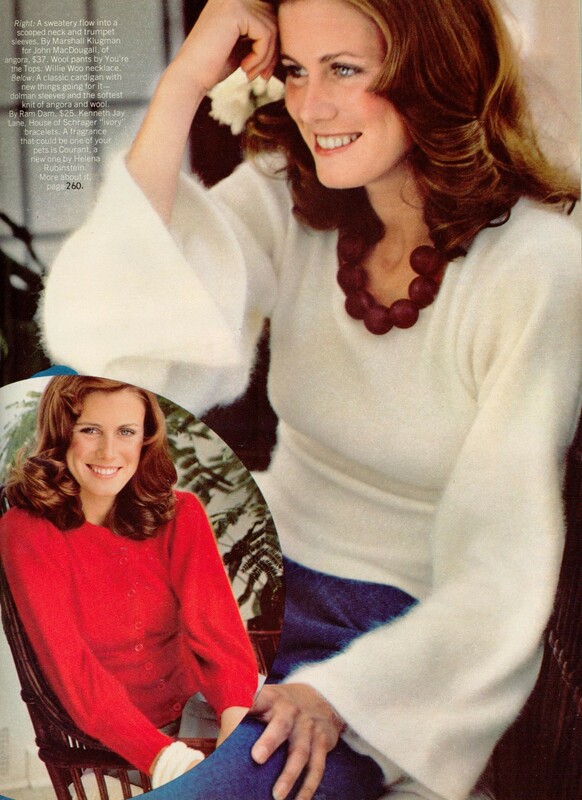 These fuzzy beauties are from the October 1972 issue of Glamour magazine. The 1970s angora sweaters tended to be lighter, cuter and in more pastel tones. It’s always fun to see how each decade showcases its angora. It truly is an everlasting fiber!